A charming activity took the children of Kavewa by storm one overcast Saturday morning. All the school children from Kavewa Village had just come back home for the weekend from their boarding school in Drua Drua (another nearby island) when they were assigned to go pick as much propagules in the mangrove forest as they could for some mangrove replanting session. Like wound up toys, they disappeared like a lightning flash and came out of the mangroves an hour later with red mangrove propagules in their arms. They were so excited! One by one they came out with an armful of mangrove propagules, ready to start a mangrove planting activity in Kavewa’s coastal shallows. 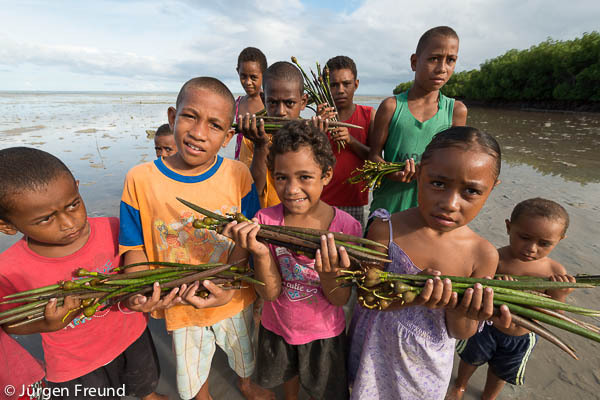 Children of Kavewa Island start a mangrove planting activity with freshly picked mangrove propagules. Another picture of the kids holding mangrove seedlings just because they’re so cute! Like soldiers on a mission, children of Kavewa lined up the barren coast and started planting. Emosi took charge of the kids and gave instructions where and how to plant the seedlings. Some boys were serious and some were more playful. But the girls were the ones who wanted to plant mangroves perfectly. Mangroves are plants that serve as natural buffers between the ocean and the land. They protect the islands during storms and cyclones. Mangroves grow and proliferate and can become forests if left alone. Unlike man-made seawalls, mangroves do not easily break or fall apart with time. Through years of growth, mangroves become bigger and stronger and their root system hold the coastal sand and ground together to prevent erosion. On the south side Kavewa Island, the limestone cliff walls of the island show a natural concave structure that has eroded through the years and shows how it has been eaten up by constant wave and wind action. South side of Kavewa Island with limestone walls eaten up by wind and wave activities through the years. 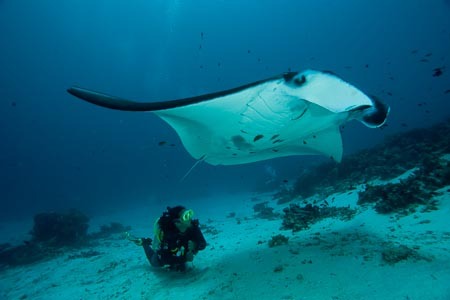 On the northern side of Kavewa are two nearby limestone rock islands small enough to snorkel around in a few minutes. The farthest one is called Vatu Iwai with different sea birds calling it home and the one closer to Kavewa is Vatu Cicila where there is a small colony of fruitbats roosting during the day. Fijian woman gleaning the Kavewa Island coast at low tide. Her back drop are the two nearby limestone islands – small Vatu Iwai and larger Vatu Cicila. Brown boobies perched and flying above Vatu Iwai Island. Vatu Cicila Island with fruit bats roosting at daytime. When we got to the farther little island by boat, I couldn’t believe my eyes seeing such beautiful corals in the shallows right beside the limestock rock outcrop, with brown boobies and 3 species of terns flying all around us. I couldn’t wait to jump in to see the beautiful plate corals which shimmered like jewels from the surface.